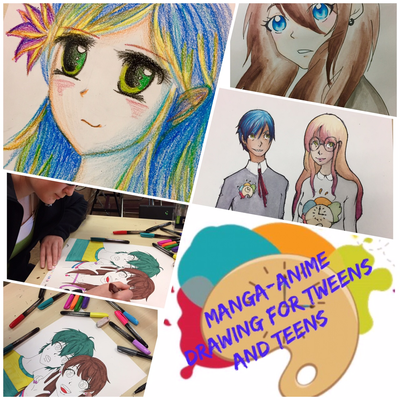 Manga/Anime for Tweens and Teens. For kids that are really into animation. Ages 10-14. Available: Mondays or Wednesdays 4:30pm – 5:30pm. Instructor will show drawing techniques with a fun cartoon twist that work with many drawing mediums. For Manga/Anime, kids will also learn drawing fundamentals that apply in realistic figure drawing. We usually focus on developing skills using graphite and charcoal pencils. We will also often include pastel or crayons, color pencils and even watercolors to add excitement to the kids drawings. We will work on monthly projects but at the end of each class children will be able to take home their very own practice character creations. You may register at any time during the session and we will prorate the tuition price.All Materials are included. *Must choose specific day(s) of the week (Monday or Wednesday). PLEASE DON’T FORGET TO SEND PARTICIPANT NAMES AND AGE IN THE COMMENTS SECTION OF THE ORDER OR AFTER AT INFO@PAINTINGTIMENOW.COM INCLUDING THE ORDER NUMBER.